As Toyota kicked off its participation in the Montréal International Auto Show, the company confirmed it would launch starting with select fleets in Québec, where the Mirai will take advantage of the province’s clean hydroelectric power generation. “Toyota is passionate about helping Canada, and societies around the world, enjoy a greener future – as we have outlined in our Environmental Challenge 2050. And the Mirai – a zero-emissions, production model sedan – is an important milestone as we work to achieve this,” said Martin Gilbert, Director of Sales Planning and Innovation, Toyota Canada Inc.
“The arrival of the Mirai in Quebec is perfectly in line with the adoption of the zero-emission vehicle (ZEV) standard last December, which aims to substantially increase the number of electric cars on Quebec roads”, said Isabelle Melançon, Minister of Sustainable Development, the Environment and the Fight Against Climate Change. Of course, Mirai needs a source of hydrogen, and since Hydro Québec is the world’s fourth-largest producer of clean hydro-electricity that means that the hydrogen used to drive Mirai will be produced from remarkably clean sources too. Toyota Canada has been working closely with partners in Quebec over the past year – in particular, the Ministries of Energy, Environment, and Transportation – to ensure the introduction of an appropriate fueling infrastructure in the province. With its advanced technology under the hood, the 2018 Toyota Mirai delivers three key benefits that Toyota feels are important to Canadians. 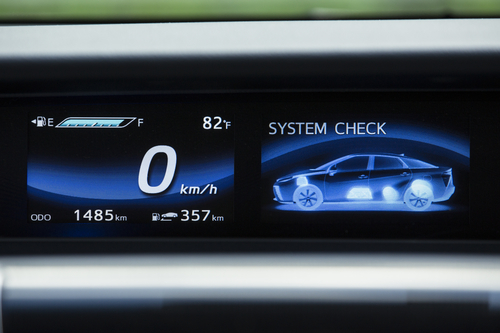 First, there’s no need for range anxiety, as the Mirai can travel more than 500 km on a tank of hydrogen. Second, refuelling time is similar to a regular gasoline vehicle, taking approximately five minutes to refill the tank. And third, the Mirai has proven cold-weather reliability – especially important as many parts of Canada have experienced new, record-cold temperatures this winter. 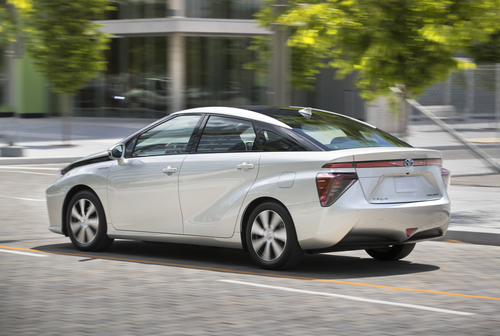 Mirai stores hydrogen in its fuel tank. This is combined with oxygen in the fuel cell stack. The resulting chemical reaction produces two things: electricity, and water. The electricity powers the vehicle, delivering 151 peak horsepower and up to 247 lb-ft of torque. And the water leaves through the tailpipe as Mirai’s only emission. 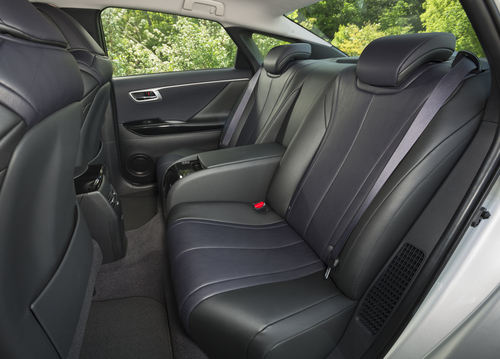 Beyond its remarkable power supply, however, the Mirai delivers exactly what drivers have come to expect of Toyota: a stylish, feature-rich, fun-to-drive four-door sedan. The aerodynamic body is highlighted by LED headlamps and daytime running lights, touch sensor front door handles and trunk lid, and 17” alloy wheels. Noise-reducing glass contributes to a quiet, comfortable cabin, featuring heated seats for everyone, electronic push-button start, power adjustable steering wheel with built-in multifunction controls, and more. 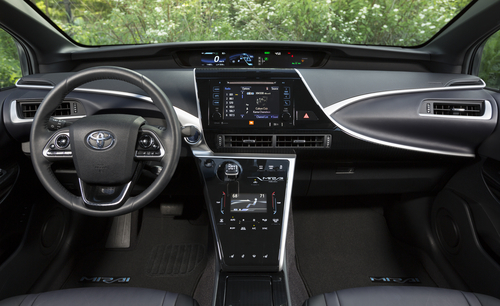 And as a Toyota, the Mirai also delivers the peace of mind of uncompromised safety, including radar cruise control, pre-collision system, lane departure alert, automatic high beams, eight airbags, a backup camera, blind spot monitor with rear cross traffic alert, and more. Stay tuned to these pages for more information on Toyota’s hydrogen-powered sedan, the Mirai and when it will become available in other regions across Canada.